This Cuban style marinade takes the pork roast to the next level of flavor! It is packed with amazing flavors and the meat soaks those in, as it cooks and softens in the slow cooker. Once cooked, you can shred it and serve in your favorite tortillas (flour or corn work!) and your favorite toppings - we recommend sliced red onions and chopped cilantro. Enjoy! Place the pork roast in the base of the slow cooker and sprinkle with a little salt and pepper. In a small mixing bowl, whisk together the orange juice, lime juice, minced garlic, paprika, dried oregano, onion powder and ground cumin. Pour the marinade over the pork roast. Set on low and cook for 8 hours. Once cooked, shred the meat and mix into the sauce. Spoon into the tortillas and top with sliced red onion and chopped cilantro garnish. 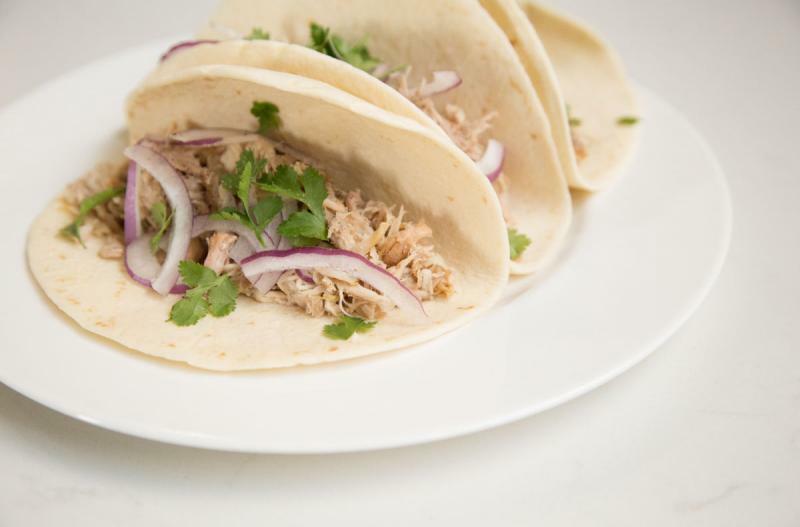 Serve Cuban Pork Tacos with veggies. In a small mixing bowl, whisk together 1/2 cup orange juice, 6 Tbsp lime juice, 4 tsp minced garlic, 4 tsp paprika, 2 tsp dried oregano, 2 tsp onion powder, and 2 tsp ground cumin. Recipe is gluten-free when served with gluten-free corn tortillas. Thaw and slow cook on low for 8 hours. Once cooked, shred the meat and mix into the sauce. Garnish with sliced red onions and chopped cilantro. Serve in flour tortillas with veggies.